Sidewalk cafes may be operated by restaurants or other businesses that are licensed to serve food and beverages, including alcohol. The cafe space is privately managed by the business, open for use only by its customers, and separated off with barriers. Table service may be provided. A street patio (a.k.a. “parklet”) is a sidewalk café created in street space formerly devoted to parking. It is permitted as a type of sidewalk café. By converting street space to a use that serves people, street patios can help make cities more welcoming and people-friendly. Austin City Council Resolution No. 20120322-067 directed the creation of the street patio program. A Temporary Sidewalk Café Permit from ATD’s Right of Way Division allows the creation of a temporary sidewalk café and/or street patio. The permit is good for up to five years; it is significantly more affordable than the license agreement required for a permanent sidewalk café. 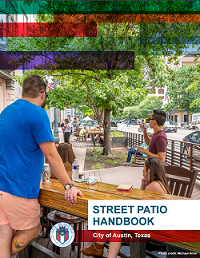 Before applying for a permit, please read in full the City of Austin Sidewalk Café Handbook and/or the Street Patio Handbook, which include helpful design guidance. Please also read in full the application form and additional related documents below. When you are ready to submit your application, please schedule an appointment with Right of Way staff in advance by calling 512-974-1150. It is suggested that you allot 30 minutes to one hour for review and discussion. Please review the permit process flowchart in the appropriate handbook for application preparation and submission details. To apply for a Temporary Sidewalk Café Permit, which applies to both sidewalk cafes and street patio structures, please download, complete and submit the Temporary Sidewalk Café Permit Application (see application for submission instructions). Duration: Permit may be obtained for one to five years. Process: Streamlined and simpler permit approval process. Reviewing Department: Austin Transportation Department, Right of Way Management Division. Note that additional departments may be included, depending on the design complexity, proposed café furniture and elements, and/or proximity to utility infrastructure. Installation: To be temporary, the café structure must include removable barriers that are affixed to the sidewalk with no more than one bolt in each corner of the café space, with a four bolt maximum. Fees: $100 application fee and $200 (for sidewalk cafes) or $2,000 (for each parking space in a Street Patio) annual permit fee(s). All sidewalk cafes installed on a City-owned sidewalk, or other areas of the public right of way, require either a sidewalk café permit or a license agreement from the City. An outdoor café sited entirely on private property does not require a Right of Way permit or a license agreement. 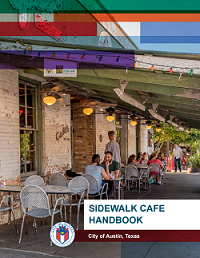 Sidewalk Cafés and Street Patios are not permanent structures; they are a temporary use of the public Right of Way permitted as a type of sidewalk café under the City of Austin Land Development Code Chapter 14-4, Sidewalk Cafes. Please see the City of Austin’s Sidewalk Café Ordinance.